I love to see old fashioned chickens running around. Kind of like Beyonce and her girls, they like to strut & cluck in formation. 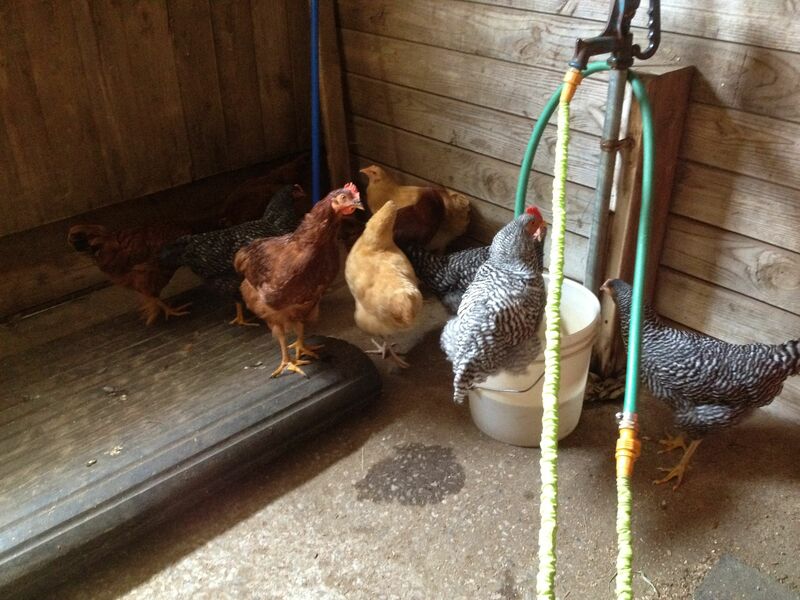 We’ve got a mix of Buff Orpington, Plymouth Rock, Rhode Island Reds and White Rocks. My first ten chickens are truly and fully free ranging. 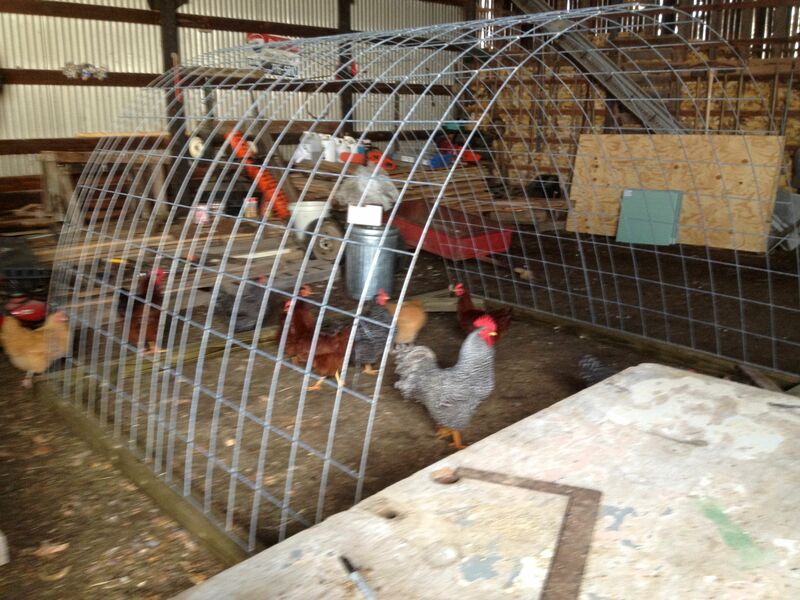 I have a small coop for them that is designed to be moved around. But in all reality, for my purely selfish convenience, I don’t move it very often. The chickens are few enough that they couldn’t possibly overwork the amount of territory they cover, so they do whatever they want, whenever they want and (usually) just file into the coop at dusk. Because they are near to the hub of the farm – buildings, barns and activity, they are relatively safe from raccoons and the coyote that roam freely over my pastures. I don’t need electric fencing or patrolling dogs to keep them safe – their biggest danger is from cars and themselves. And guess what? With all the free choice available to them, know where they choose to be? Inside! Oh sure when the day is pleasant they’ll be outside for most of it. 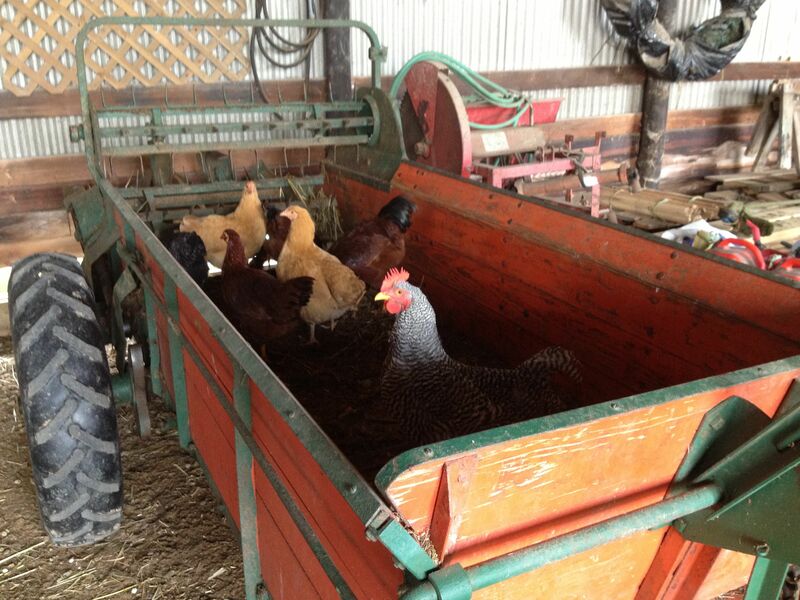 But chickens don’t like to be rained on, they don’t deal well with baking sun, and ice & snow is just not their thing. Plus, chickens are just plain nosy. They want to get their beaks & claws into everything that goes on around here. At least they’re in the manure spreader! Chickens poop EVERYWHERE! The workbench: very irritating to have your project pooped on! Occasionally the price of freedom is all. 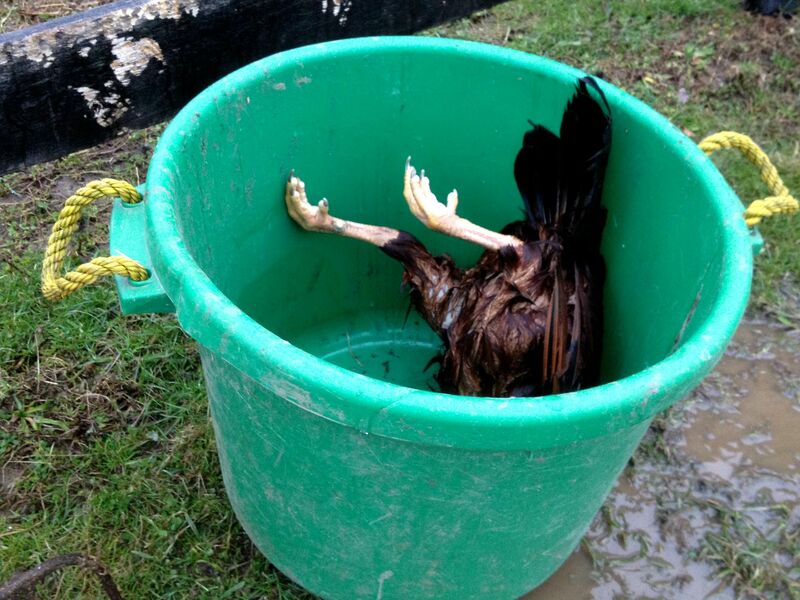 Red Rooster wasn’t so lucky when he fell into a half filled water trough. And the little red hen who was hit by a car when she learned to cross the road. May I just remind you that if you travel country roads, please, please be considerate of farmers on slow equipment, Amish buggies and wayward farm animals? Do you enjoy a good Easter egg hunt? Sure you do, unless every day is Easter like it is around here. 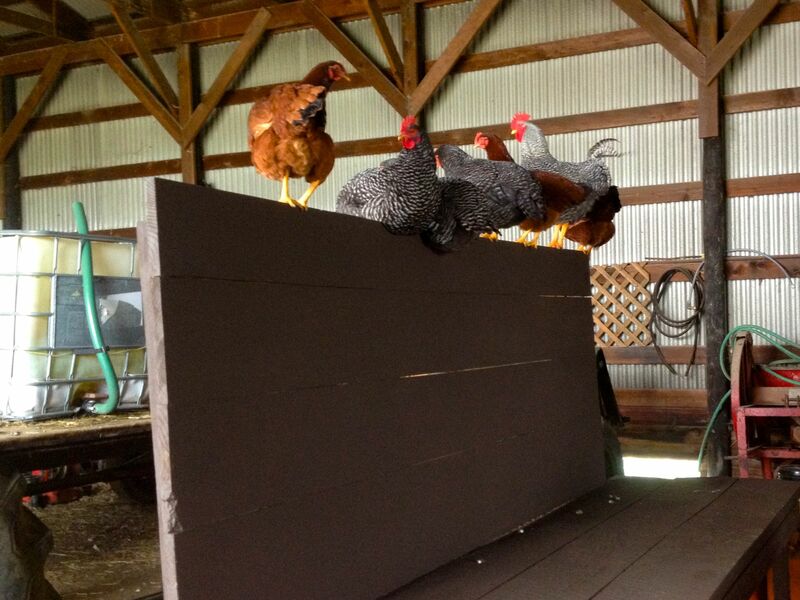 Since those girls do whatever they please all day, who knows what whim will decide where they lay their daily egg. Trust me, it loses its charm. Somewhere, I’m pretty sure, there’s a cache of rotting eggs I’m going to find one day. 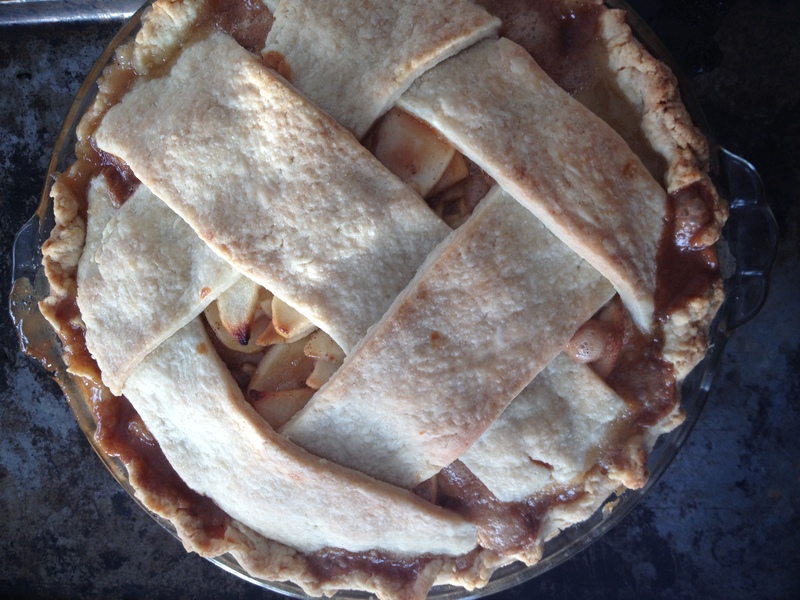 Hopefully before I hit it with a pitchfork, shovel or boot – yikes! So, the real working girls here live a little differently from those free-ranging gypsies who have now decided to cross the road. 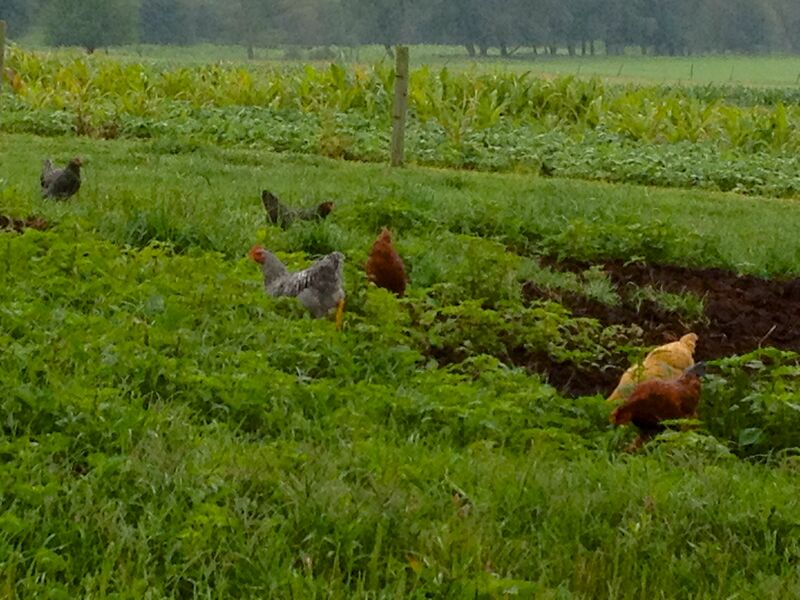 They are kind-of free range chickens. They are sheltered, fed a balanced, all natural, meat-free ration, are given plenty of space and roosts and can wander on pasture within a confined, moveable space. And, you know what? The girls are happy and satisfied with their end of the deal. In exchange for comfort and safety, they trade their ability to cross the road and drown in water troughs. They still have ample room to socialize, plenty of food, water & dry bedding and dirt for dust baths. But for winter, the girls are inside where the deep pack bedding keeps them dry and warm. Come spring, when the pasture dries, their houses will be moved to follow the cows where they can graze and hunt while staying dry & healthy and keep from tearing & rutting up the ground. See, all-free and super-confined are the polar ends of a spectrum. There’s a wide, wide range of happy solutions in the middle. Each farmer adapts his/her system to the feed supply available, the number of enterprises requiring management on their particular farm, the aggressiveness of predators, condition of the pastures and the availability of helpers. So, even though that recent Paleo article written by an author with zero animal experience told you chickens and pigs should be raised outside in all weather eating all grass and no grains, often times there are happier hybrids for the animals and the farmers. 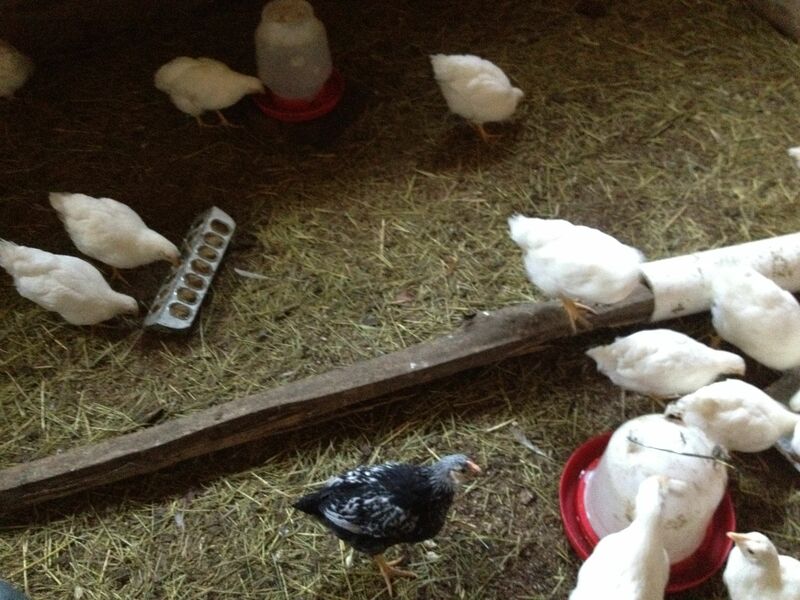 A group of White Rock pullets (and one mystery chick) get their winter start in the barn on deep pack bedding. They’ve got plenty of roosting space, things to climb & explore and you cannot believe how much all natural vegetarian feed they eat. Come spring, I’ll kick these freeloaders outside to earn their own living. When the wind is whistling around the eaves of my house and I’m tucked under my down comforter, I know my cows would be spending long hours huddled, hump-backed trying to break the wind with their rumps. The pigs would be shivering in a heap and the chickens would have freezing feet, wet feathers and frostbitten combs. And those visions keep me awake. All night. Make me feel sick even. Spending a miserable winter without shelter may not kill them, but when the weather is sleeting and blowing they sure are eager to get inside where it’s dry and there’s a warm bed and a drink without ice cubes. Just like us. God didn’t make insulated houses with central heat and air conditioning for people either, but I sure am glad to have one. You’re a good mom, Jackie! aw you sound like you’re always so lovely and care-taking. And to be honest, I almost laughed when I read this: “I love to see old fashioned chickens running around. Kind of like Beyonce and her girls”. I’m gonna see Beyonce whenever I see old fashioned chickens now.